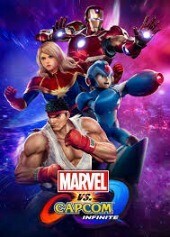 Thor, Hulk, Mega Man, and Ryu all get new looks depending on which pre-order pack you get. This is apparently what happens when the Dark Dimension fuses with Darkstalkers' Makai Kingdom. We got a chance to mess around with the story, mission, and training modes. We asked your nerdy questions and Capcom answered. I walked away from the story mode wanting something more: stupid fun. We got to ask Capcom a bunch of nerdy questions about Marvel Vs. Capcom: Infinite. "Ultron Sigma" is the kind of name two robots would come up with! You can't call in assists, but you can swap characters instantly for more diverse combos.